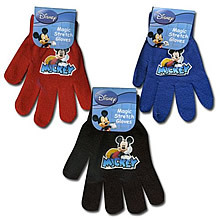 Kids knit gloves that stretch like magic to fit most. 80% acrylic/17% polyester, plus 3% rubber/spandex. Unstretched size from bottom of glove to end of middle finger is approximately 6.5 inches; fully stretched is approximately 8.25 inches. Available in red, blue, and black.